We are open today and tomorrow for Empire, Jonagold, Crimson Crisp and Golden Delicious. There are a few MacIntosh, Gala and Cortlands left. There will be cider today and cider & donuts tomorrow. The wooden iPod apple has not yet been found. The very large crowds this past weekend had a great time and picked essentially all the mid season fruit, so we will be closed this week Tuesday, Wednesday and Thursday. 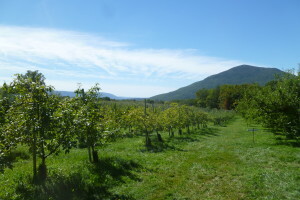 We will open the small crop of later varieties (Empire, Jonagold, Crimson Crisp & Golden Delicious) on Friday. These will rapidly get picked out, so Saturday Oct 1 will be our last day for the 2016 season. We knew from early in the growing season that this would be a short crop and we are glad that many people were still able to get nice fruit. We hope to have a more normal crop next year. Thanks to everyone who came and picked!! The views are as good as ever – there continue to be Galas, Honeycrisps , Cortlands, Macouns and Macs, but not as many as earlier. There are beginning to be more drops – especially Honeycrisp. We will start our late varieties ( Empire, Jonagold, Golden Delicious and Crimson Crisp) on Friday Sept 30. Saturday Oct 1 & Sunday Oct 2 will be our last weekend and we expect to close by Thursday Oct 6 – we will not have enough apples to be open Columbus Day weekend. There will be cider all week – donuts on both weekends. The wooden apple has not yet been found.